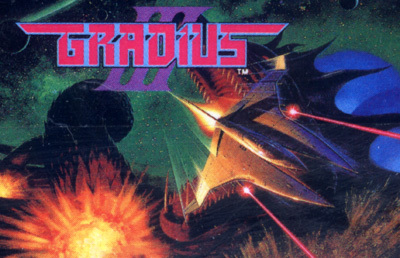 Gradius III is a scrolling shooter arcade game, developed and published by Konami in 1989 for video arcades. The player returns as the role of the pilot of the Vic Viper starfighter to battle the onslaughts of the Bacterion Empire. A port of Gradius III was released for the Super Famicom in December 1990 and the Super Nintendo Entertainment System in 1991 with reduced difficulty and additional armaments for the Vic Viper. It replicates the slowdown of its arcade counterpart and discards the pseudo-3D and Crystal levels. It also introduces a boss called Beacon which awaits the player at the end of the new high-speed stage, which is a counterpart of the high-speed stage in Gradius II. Unlike any other version, the Super NES port is the only one that allow players to continue when they lost all their lives. A harder difficulty called "arcade" can be unlocked by inputting a code on the options screen, however, it is simply the same SNES game at a harder difficulty, and not an accurate port of the arcade version. In addition, most stages (and some bosses) from Gradius II will appear after the second level.